Sets and reps are fundamental to the structure of most weight training routines, yet for anybody new to exercise the terms may not be fully understood. “Sets” and “reps” are explained below. “Reps” is the shortened term used for “repetitions”. The act or process or an instance of repeating or being repeated. In weight lifting terms, a repetition (rep) is one full completion of the exercise movement, composed of the concentric phrase (or “positive phrase”), when the target muscle shortens, and the eccentric phrase (or “negative phrase”), when the target muscle lengthens. The exercise begins with the arms outstretched to the side of the torso, the body erect, and the barbell grasped at thigh height. Whilst sound posture is maintained, the barbell is curled upwards so the arms become fully flexed, and the barbell is at shoulder level. The movement described so far has been the concentric phrase of the repetition. The movement is then reversed in a controlled manner, so the barbell returns to its original position. This aspect of the movement, when the barbell is descending and the arm flexor muscles are lengthening, is the eccentric phrase of the repetition. The whole movement explained, composing of the concentric and eccentric phrases, is one “rep”. There are various other terms which include “reps” within their name. “Cheat reps” – Using body momentum to aid in a repetition. This is an advanced training technique, used to push the target muscle group past its capabilities to stimulate progression. “Partial reps” – A repetition which is performed through a limited range of motion. A partial repetition may be performed if the trainer is unable to execute the full range of motion due to fatigue, or alternatively as a technique to stimulate the muscle through a favourable range of motion. “Negative reps” – Only the eccentric (negative) phrase of the repetition is performed during negative repetitions, with the concentric phrase aided by a training partner. 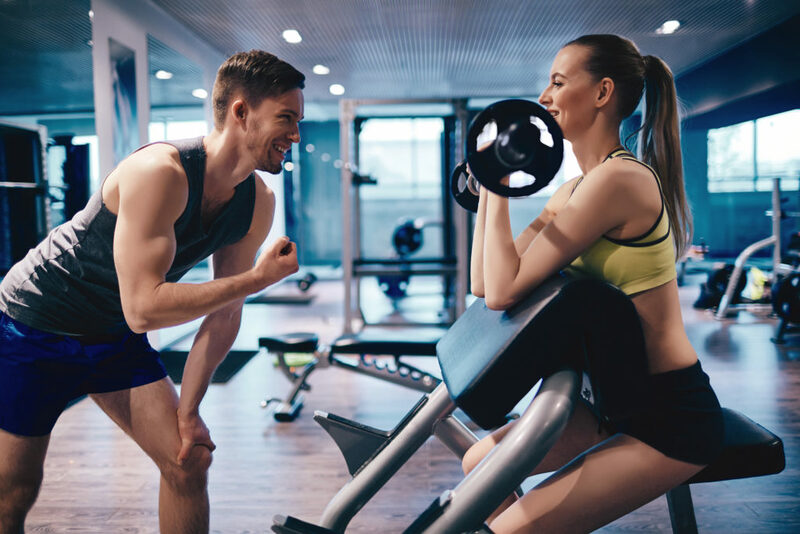 The aim is to cause much greater stress to the muscle, as greater resistance can be used, and the eccentric phrase of the repetition damages the muscle fibres more greatly. “Forced reps” – Repetitions which are aided by a training partner, often when the trainer is unable to complete the repetitions on their own. A way of pushing the muscles past their current capabilities to encourage progression. A collection of “reps” is known as a “set”. 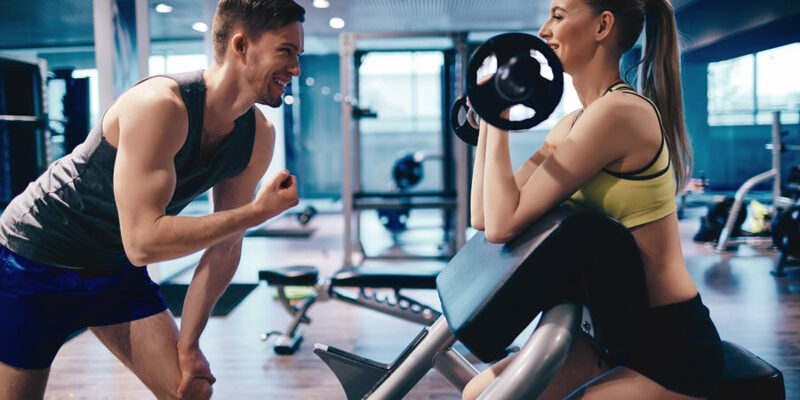 “Sets” are (commonly) composed of continuous repetitions of a given exercise (the number of which is usually predetermined by the trainer), which is then followed by a rest period before another set is performed, or the trainer moves onto another exercise. If a trainer wishes to perform 3 sets of 10 repetitions of the barbell curl: 10 back to back repetitions are performed (i.e. there is no rest periods between the repetitions), followed by a rest period (typically a duration of a couple of minutes). After the rest period has past, another 10 repetitions are performed, followed by another rest period. The final 10 repetitions are executed after the rest period. 3 sets of 10 repetitions have been completed. Each “set” was a collection of 10 repetitions. There are various other terms which include “sets” within their name. “Drop sets” – A typical set is performed close, or to full, failure. The weight/resistance is then reduced (dropped), and another set is performed with the reduced resistance, (usually) without any rest period. This process can be continued, although there is commonly no more than three “drops” performed as a whole. “Tri sets” – Three sets are performed back to back, with each set composed of a different exercise, which all target the same muscle, or muscle group. An example would be a set of barbell curls followed by a set of dumbbell curls, followed by a set of reverse barbell curls, without any rest in-between the sets.